The same failures repeat for blunt skulls. #1. Name it. Address the past. Name the bad decisions and behaviors that led to failure. I didn’t explore constructive dissent. I allowed others to lower my standards. I didn’t discuss this with mentors, advisors, or a coach. I assumed things would go smoothly. I put confidence in untested team members. 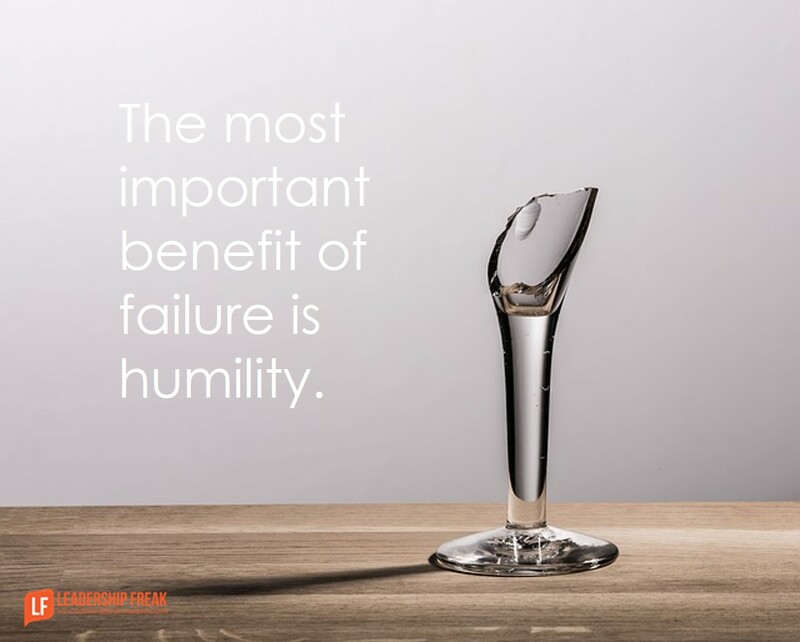 The most important benefit of failure is humility. #2. Claim it. Own the present. #3. Reframe it. Move toward the future. Invite input. What suggestions for future success do you have for me? I need to stop ______ , in order to be the manager I aspire to be. I need to _______, in order to be the leader I aspire to be. I’m learning that managing requires …. I’m learning that my team needs …. I see in myself a …. Don’t sweep failure under the carpet. When you fail to benefit from failure, you double defeat. If your organization shoots its wounded, get the most from failure with someone you trust. Use the ‘three steps to come out smarter after failure’ with yourself, direct reports, and teams. Spend 30% of your time looking back and 70% of your time looking forward. Address failure from a positive orientation, even when facing negative consequences. What might be added to the Name it – Claim it – Reframe it approach? What questions or statements help leaders get smart after failure? Thanks for this. Being sorry is not enough. One must specifically acknowledge responsibility, make restitution or corrections if possible, and turn over a new leaf by changing direction. If trust was broken, one might have to step down, or impose on oneself very difficult to meet standards for accountability and openness. What part of this recent experience made me feel most uncomfortable and why? The intent is inward facing reflection. In one case it was ” concern over what others in their company and their network would think of them” . Very personal. As a coach this helped me understand what we really needed to work on was this person’s need for what others thought of them was higher than the business growth objectives. To the point of this 3 step program it is good enough. I would like to add that imho, most of what we do is habit. And habits are nothing more than patterns. We can analyze them. And even ask important questions. But the trouble is the source. The trouble is we are in our own orbit. So a scary, tough thing to do is to ask someone who we know does things better in the same context (i.e. Even someone we don’t respect may be better in certain situations & it is up to us to see this clearly). In fact sometimes the best thing to do is find that person who practically hates us or our ‘way’. Different outcomes – different ways to try things – being ready for failure but perhaps success? This post would also be a good tool for self-reflection and assessment–even before failure occurs. I would like to use this to help analyze my weaknesses, to always be moving toward future improvement. Thank you for the post. Dan, this is one of the best to date, and I’ve been following you for years. So grateful for your regular input and the potent clarity with which you deliver these various leadership scenarios. As a younger leader, I am growing immensely from naming, claiming and reframing my shortcomings on the growthpath that is leadership. This is being shared with fellow leaders in our global org, and being printed for my office. Thanks! Great post Dan. I really appreciate good strategies for apologizing and learning from mistakes.